Some UFO hunters are claiming it is “proof” that aliens are here. The video was uploaded to MUFON, a UFO hunting YouTube channel, which said: “We see what appears to be a black object in an oval form moving from right to left. “At normal speed it is easy to miss, but the submitter added a slow motion clip which gives us a much better view. Conspiracy theorists quickly picked up on the video, with Scott C Waring, a prominent alien hunter, claiming it is “Proof of aliens in New York state”. He wrote on his blog UFO Sightings Daily: “This video was taken in New York state last week. The UFO is seen passing though the clouds and totally caught by accident. 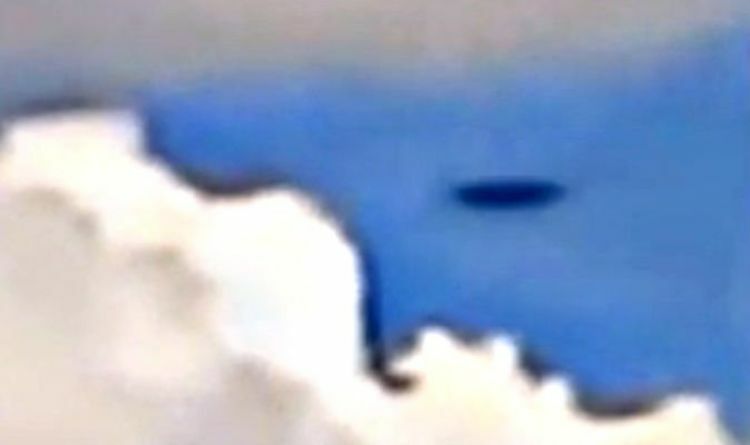 “It is moving so fast it looks like only a shadow, but this UFO compared to the size of the cloud is easily 15-30 meters across. “Also the fact that this object passes behind the cloud rules out insects, birds, drones.